Posted on February 6, 2019 by Teagan R. Geneviene •	This entry was posted in Hidebound Hump-Day, Teagan's Books and tagged Copper the Alchemist & the Woman in Trousers, Cornelis Drebbel, Fantasy, Pantser, Purple, Steampunk, Submarine, Tea, Teagan Riordain Geneviene, Victorian Era, Vintage. Bookmark the permalink. Many thanks for sharing, Sally. Mega hugs! Thanks so much for visiting. Mega hugs! I’m thrilled I could entertain you, Jennie! I owe you some visits. Sorry I’ve been so scarce. Hugs on the wing. Happy Saturday, Melissa. Thanks for reblogging with this marvelous intro! Mega hugs! These chimps are getting ever the more interesting as the story unfolds. I just finished reading Atonement in Bloom and enjoyed it very much. Good work, Teagan! Dear Lavinia, that is music to my ears! Thanks so much. I’m thrilled that you enjoyed Bloom! Thanks for being on this crazy submarine, my chuckaboo! Hugs on the wing. A pot of tea to compliment each course – now that’s an interesting idea. I like how you include whimsy into your work. Thanks, Jan. This was originally a culinary mystery (I’ve removed recipes and such this time around). I based that scene on an actual Victorian menu my research turned up. I actually removed quite a bit from it, but this is the menu I had previously. And each course with a different pot of tea. Quite a tea party, huh? Translocated apes. Wow! This story gets more and more intertwined as we go. I actually found myself liking Cal Hicks and all his purpleness. 🙂 Fantastic segment, Teagan! Thanks, Jan. I tried to make him likable. A kindly gentleman… it’s just that he’s purple… and an ape! LOL. Have a great rest of the week. Hugs. Translocated chimps – makes sense to me. Bet you can’t say ‘perplexing purple place’ 5 times fast. I triple dog dare you, Teagan! Another really great installment and I love where you left off…..perfect! Thanks so much, Kirt. That’s great feedback. When there’s not a real “cliffhanger,” it can be hard to decide where to stop. PS: Next month I’ll be looking at my decorating budget. If you think of any of your prints that have a whimsical feeling, and bright colors for my high desert cottage, feel free to post a link to your gallery here. Things with some teal/aqua and a splash of red or yellow would be of particular interest. I might even do a decorating post, once I’m settled. I will forward a link and some thoughts…. https://thewallgallery.com/ Here’s a link to my main gallery. You will see the separate galleries by “type”…browse and see if anything peeks your interest. On the color aspect…if you see something you like, but you would prefer it in different hues…that’s the beauty of digital art…I can play with that and see if we can come up with a “hue” palette you prefer. If you don’t see anything you like, again no worries. Thanks for thinking of me….happy viewing!! Thanks, Kirt. I saved several ❤ favorites. I used the system to email a question about print sizes. I'm trying to resist the temptation to go ahead and get a few things for the house, even though I should wait until I get moved in. But the decorating/planning helps distract me from the ordeal of the drive ahead. No worries at all Kirt. I’ll send you an email. Hugs. Thanks, Dan — that will mean a lot to Rob. LOL, I think Truckin’ would be a good theme song for this story. Maybe the mood doesn’t quite fit, but it surely is a long strange trip. More hugs! Masterfully done, Teagan. If the story itself wasn’t so darn interesting and exciting, watching you craft your way through, three things at a time, would be fun enough to see. I was going to copy out the blurbs that I really liked and choose one to mention, but I like all three: “I turned my gaze to the well-rounded form of the housekeeper. Seen from behind, she looked remarkably like Cookie.” This just made me laugh, and it made Felicity seem so real. “I knew it was our host he didn’t want to offend. He certainly wouldn’t be concerned about my pricked ego.” As I’ve said before, I love the interplay between these two main characters, but this is a unique way of calling attention to it. And, I like the way you work around needing to get information out without just saying it – “Well, perhaps a refresher will help it along then,” that reminded me of your using Lilith to describe certain scenes in Atonement. Sorry for the overly long comment. Feel free to hush me. Dan, this is music to my ears. I would never hush you! You know I always need encouragement, and I appreciate yours more than you could know. And it was not a long comment. I owe you a visit. I seem to be snail-slow with the moving work. Yesterday I was afraid for a minute that I packed Crystal. Fortunately I spotted her across the room before I undid everything in that very difficult box! LOL. Happy Lunar New Year. Hugs! Thanks Teagan. I’m glad you enjoy these. Some of these things just impress me. 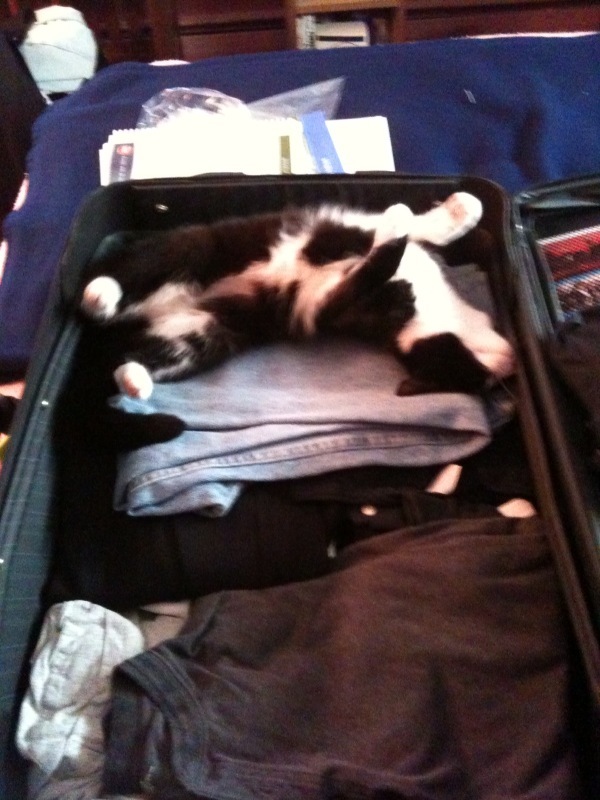 I have pictures of MiMi in my suitcase, in the Christmas ornament box and in every shape and size box we’ve every had. Before we toss any box out, we check to see where MiMi is. This is one of my favorites – just before I was leaving for a flight. That could be, Teagan, but I don’t know. I think MiMi might like to travel, but only if I could let her out of the carrier to explore the train/plane. Then again, maybe it’s just that those clothes were clean and didn’t have any cat hair on them. No, Rob, thank *you* for sharing your imagination of Cornelis. Thanks again for rerunning the interview you did with me at your Art Studio! Wow, I didn’t see that coming! Great episode, Teagan! Thanks for that great feedback, Jacquie. I’m glad I can still throw in a surprise! Hugs on the wing! Yes, Michael. I’m trying to see it as a very, very good prophecy! I really need a good year. I’ve always wanted to somehow take the “Atonement” universe to a desert setting. Now, once I get moved, maybe I’ll be able to see that spin-off story. I appreciate your support so very much. Even though I can’t access your blog, I’m happy that you continue your writing and blogging. Happy Lunar New Year and hugs! Hi Denise. Between purple apes and animal totems… why, I guess there’s a whole zoo inside each of us. LOL. Thanks for taking time to visit, my chuckaboo! Happy Lunar New Year. Hugs! Sally, my chuckaboo, thanks for sharing from your Smorgasbord! Mega hugs. Tee-hee! That was my favorite too, John. I’m delighted you enjoyed this chapter. Yesterday my lunch break was taken by my little shiatsu massager with my back. Today I hope to have a better break from packing, so I can catch up with your story day. Olive oil, my chuckaboo! Wow, we definitely made some big progress in this episode, Teagan. Very well done. Thanks so much, Robbie. I appreciate that you recognized that as progress. I don’t remember what brought me the church and translocation of the chimpanzees, but it was a sudden idea. The last 2/3rds of a purely pantser story… well, that’s when it really starts to get difficult. Hugs on the wing! Yes, I can understand that because you have no plan and you need to bring it all together. I thought it was a stroke of genius. Thank you kindly for sharing from your place, Don. Mega hugs! Thank you for the lovely shout-out, Teagan. You’re great at writing what you write. It’s obvious you love your genre. As usual, you picked the perfect way to use the three ingredients in your story. ❤ Happy and safe packing. Mary, my chuckaboo, you are most welcome. Thank you kindly for visiting with your lovely comment. What a cliffhanger of an ending, Teagan. I gasp at the thought of all those chimpanzees being translocated from those in the chapel. Has the thin veil between our world and the amethyst world been crossed? Happy Chinese New Year. May it bring lots of hugs. Hi Hugh, my chuckaboo! A hug-filled year is a wonderful thought. Wishing the same for you! I didn’t have that translocation idea planned in advance — not even an episode before. I’m not sure what made me think of it now. Yes, happy 🐖 Year of the Earth Pig. 🐖 Hugs on the wing. Whatever it was, it sure worked to your advantage, Teagan. It recently took me three weeks to come up with an ending for a short story. Sometimes, we have to wait for the ‘cliffhanger’ train to come into the station. Haha… so true, Hugh. Have a thriving Thursday. I’m glad he has a friend in you, dear Magician. Thanks for sharing from your place. Have a wonderful rest of this week. You’re the cat’s pajamas! I love this. It’s great that the harmonic tuner had that effect. And one mystery of the apes has been solved. Now, how will you rectify things? Hmm… I can’t wait to find out! Awesome job, Teagan. Hi Staci. My cuckaboo, I’m delighted to hear that. At this point I was doing no small amount of nail biting about bringing it all together to close. LOL. Hugs on the wing! Although I haven’t been able to keep up with this story due to my weekends offline and a killer deadline, it’s clearly a whirlwind of fantastical imagination! You are definitely having fun, Teagan. Hi Mae. Thanks so much! I appreciate you taking time to visit. Happy Lunar New Year. Hugs. What a tale, Teagan. Purple ape doppelgangers! Oh my, your imagination is going crazy. I can’t wait to see how you get this all resolved. 🙂 Have a marvelous day, my friend. Hugs. Ha! At this point I was getting extremely worried about that resolution, Diana. Where is your imagination taking us?!! Joanne, my chuckaboo, it’s good to see you. From cliffhangers to flat-out strange, LOL. Buckle up — there’s more to come. 😉 Thanks for being on this crazy submarine. Mega hugs! Fab episode, as always! Happy Piggy year! The same to you, Fraggle — my Chinese Zodiac twin! I’m glad you enjoyed it. I hope to do some blog visiting, during my next packing/purging break. Yesterday (for a moment) I was afraid I had packed Crystal! Olga, it really means a lot to me when people, like you, who were aboard for the first run of this serial remember parts. Thanks for sharing on Facebook, my chuckaboo. Happy Lunar New Year. Hugs! LOL, I really didn't need that kind of confirmation that I'm doing the right thing! Adored Ape, thanks so much for sharing from your tree house! Mega hugs to you and all the Naughty Chimps. Have a wonderful Lunar New Year. Good reading! Hmmm, now things are perhaps not what they seem. Daddy, not Daddy, can’t wait for the next episode! Thanks for reblogging, Dyanna. Ha! Yes, even the Doodah Man would think this was a long strange trip. 😀 Mega hugs! Gung Hey Fat Choi Teagan! I am so far behind with this series it will take weeks to catch up. I may have to wait for the book to come out. I have very high hopes for this year of the pig. My newest Grandson was born in this year! It holds lots of promise for him. He’s bound to be far more successful than his Granny I’m sure. Since I’ve been home from Baby Girl’s I’ve been on a mission to purge and downsize everything that won’t fit in my new house, or bring me value, and joy. I’m a freecycling, craigslist, and donating fiend at the moment, and in desperate need of a getaway with my camera for some wildlife, sunset, sunrise, or night sky imaging! I miss my camera as much as you must miss your pen when away from writing. I’m so distracted I can’t read much more than a snippet at the moment. Please forgive me! I’ll catch up, but I hope you publish this book cause I fear it’s going to be a while before I’m settled enough to read a book again. Hi Deborah. My chuckaboo, wishing you great happiness and prosperity as well! You’ve had your hands full with your daughter’s extremely difficult pregnancy. But now, congrats on being a new grandma! What is your “grandma name”? Plus, you have similar time/effort obstacles as me about moving. I’ve been doing those things (except Craigslist or trying to sell anything, because I don’t want to invite strangers in… It’s different when you’re alone), since November when I made the first offer on the cottage. Since my shared porch only has a 2 ft by 3 ft area where I can put donations, I’ve had to do them a few bags at a time. I’m finally finished with those donations. There will be one more when a military-base/church thrift shop comes to pickup my furniture. The Year of the Earth Pig is going to be a great new beginning for both of us. Hugs on the wing! I hear you about inviting strangers in. I don’t have people meet me at my house. I go to the mall or somewhere in public in the neighborhood, and I try to get someone to go with me.